What is the F.TEST Probability Function? 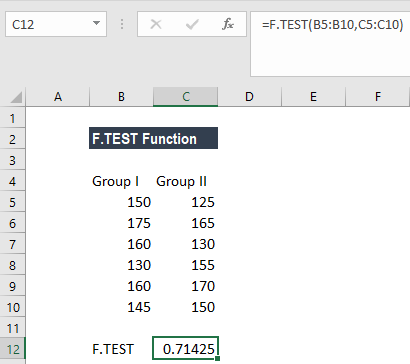 The F.TEST function is categorized under Statistical functionsFunctionsList of the most important Excel functions for financial analysts. This cheat sheet covers 100s of functions that are critical to know as an Excel analyst. It will return the result of an F-test for two given arrays or ranges. The function will return the two-tailed probability that the variances in the two supplied arrays are not significantly different. As a financial analystFinancial Analyst Job DescriptionSee a real Financial Analyst Job Description including all the skills, experience, and education required to be the successful candidate for the job. Perform financial forecasting, reporting, and operational metrics tracking, analyze financial data, create financial models, the function is useful in risk management. 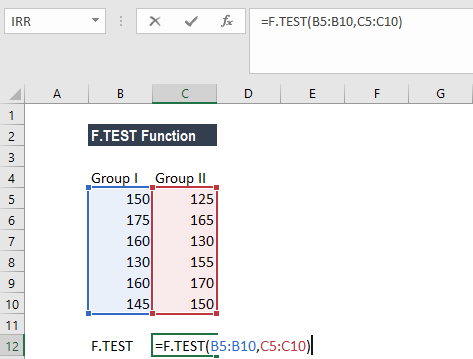 The F.TEST function was introduced in MS Excel 2010 to replace the FTEST function. Array1 (required argument) – It is the first array of data. Array2 (required argument) – It is the second array of data. The function will ignore the text, logical values or empty cells in the array. 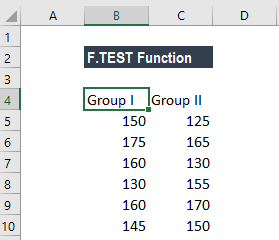 How to use the F.TEST Function in Excel? Using the F.TEST function, we will calculate the probability that there is no significant difference between the variances of the two datasets. The most common use of F.TEST is to determine whether two samples show different variances or not. The number of values in array 1 or array2 is less than 2. The variance of array1 or array2 is equal to 0.